You've probably received the email, haven't you? The one that breathlessly says that Mars will appear as big as the full Moon in the sky? That says Mars will be closer to the Earth on August 27th than it has in 5000 years, and it may be 2267 until it gets this big again? If you haven't seen it, I have reprinted it at the bottom of this page. Don't believe everything you read. The email is wrong. Mars won't be closest in August, it won't be as big as the full Moon, and it was actually closer back in 2003. But the best part is that this email is a joke, like a meme. It's a near-exact duplicate of an email sent around the internets back in 2003, August 2003, to be exact, when Mars really did have a close apparition with the Earth. Someone out there in web-land took that old email and started sending it out again. It caught on, and now everyone has seen it. People who skim emails and only read the first lines of each paragraph (I do that too sometimes!) will miss that last line, and think Mars will be that close! But as I point out in the other article, that's simply not possible. In fact, in 2005, Mars will be closest to Earth in late October, not August. It'll be about 70 million kilometers (45 million miles) away (compared to 56 million km/35 million miles in 2003). While farther away than in 2003, for northern hemisphere observers it'll be placed higher in the sky, and so it'll be easier to see and look better in a telescope, even though it wil look smaller than it did two years ago. So if you have a local astronomy club, check them out late this fall and take a look. And if you miss, don't worry: Mars will look big and bright again in just two years, not 262. 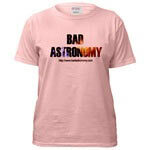 And you can find out more at the website for the magazine Sky and Telescope. Here is the email in all its glory. Remember: it's almost completely wrong! By the end of August when the two planets are closest, Mars will rise at nightfall and reach its highest point in the sky at 12:30a.m. That's pretty convenient to see something that no human being has seen in recorded history. So, mark your calendar at the beginning of August to see Mars grow progressively brighter and brighter throughout the month.